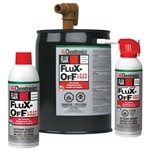 Proper maintenance is critical to ensure reliable circuitry. Not only unsightly, some flux residue can promote short circuits and corrosion, degrading or destroying the printed circuit board. 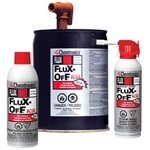 The type of flux to be removed, solvent compatibility and ease of application are all factors to consider when choosing the appropriate product. 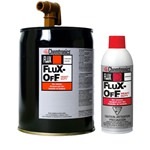 Flux-Off® is available in aerosol, BrushClean™ System, and liquid form for vapor degreasers, spray systems, ultrasonics, and dip tank applications. 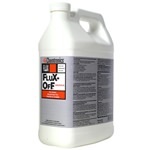 Flux-Off® products are specially formulated to remove all types of rosin (types R, RA, and RMA), no-clean, water-soluble and synthetic (type SA) flux. 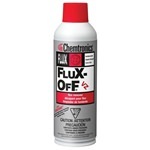 Flux remover spray can spray in any direction, even upside down. 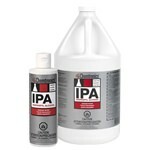 Look for the “All-Way Spray” icon on the can. 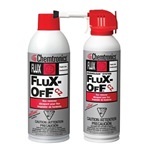 Flux removers are recommended for post-solder operations, PC boards, sensitive circuit components, component leads, SMD pads, chip carriers, plugs, sockets and heat sinks, and Thru-hole and SMT devices.